Growing up in Europe I soon became used to mosquitoes. Annoying but no big deal. Indeed, that high pitch buzzing was more of a problem than the bite itself when you're relaxing of an evening. We all seem to have an auto-defence mechanism whereby you slap yourself as the bug flies past. Doesn't stop the insect but it's more than amusing for everyone else around you. And then I came to Japan. Mosquitoes here are a different ball game altogether. They fly around with small cars splattered on the front. Much more potent that the European variety, I swear they use hyperdemic syringes and take an entire armful of blood with every snack. My first summer in Tokyo I made the rookie mistake of sleeping with the window open and no fly-screen to protect me. Thirty four stab wounds later and I was sure they were inviting their friends to the picnic. And being a relatively new foreigner to these lands, unused to these creatures from the pits of Hades, each bite swelled to the size of a small volcano with clear fluid oozing from the centre. The scratching was impossible to control. Given the choice of death or stop scratching, it was a close run thing. Japanese mosquitoes, I found, are a variety of mythical monster unto themselves. And then someone introduced me to a gift from the gods. Admittedly they waited a week, somewhat enjoying my extreme discomfort, but eventually handed me a small brown bottle. And I could have kissed them for it. 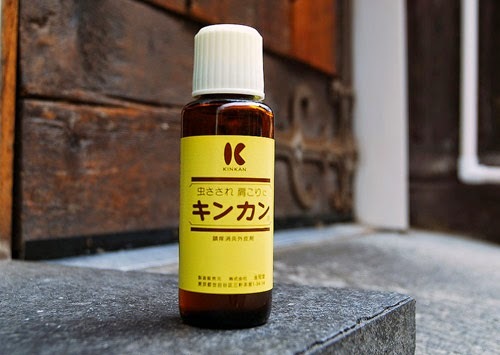 A miracle cure, Kinkan, one swipe and your misery is gone. Ammonia based (so don't sniff it!) the uncontrollable urge to scratch disappears instantly as the itch vanishes and the swelling is finally tamed. Suddenly life is bearable again. Just whatever you do, don't sleep with the window open and no fly screen. Kinkan, never leave home without it!